If your opponent has 2 or more cards in their hand than you do, you can reveal 1 "Fabled" monster in your hand and Tribute this face-up card to select 2 Spell or Trap Cards your opponent controls, and.. When this card destroys an opponent's monster by battle and sends it to the Graveyard, Special Summon 1 "Spinos Token" (Dinosaur-Type/FIRE/Level 1/ATK 300/DEF 0) in Attack Position to your opponent's .. This card gains 100 DEF for each Reptile-Type "Worm" monster in your Graveyard. If your opponent takes Battle Damage from attacking this card, at the end of the Damage Step select 1 Spell or Trap Card..
1 Tuner + 1 or more non-Tuner Dinosaur-Type monsters. 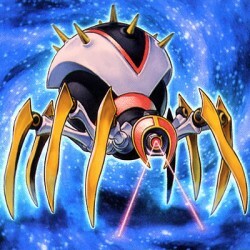 This card's ATK and DEF are equal to the total original ATK of the Synchro Material Monsters used for its Synchro Summon. If this card attacks a f..